Cinema sound has a rich history of formats, beginning with the commercial availability of monophonic sound-on-film in the 1920s. Stereo-matrix optical sound-on-film was popular in the late 1970’s and throughout the 1980’s. (“Matrix” refers to the phase-encoding of 4 channels of sound into 2.) Not only did this format fill out the screen channels with Left, Center, and Right, but also mono Surround. The format also introduced the “horseshoe” array of surround speakers in the auditorium, surrounding the audience. Bass-enhancement, as it was called, derived a low-frequency signal from the front speaker channels, which drove separate low-frequency speakers. When digital sound was introduced for film in the 1990’s, the surround array was divided to deliver a stereo surround signal, and a discrete subwoofer channel was added to the distribution format. This format remains popular today, known as 5.1 sound. The 5.1 format delivers Left (L), Center (C), Right (R), Left Surround (Ls), Right Surround (Rs), and Low Frequency Effects ( LFE, or subwoofer). The astute reader will note that 5.1 sound has 6 channels of sound. In the nomenclature of multi-channel sound, the “.1” indicates the LFE channel. As a result, when counting channels, 5.1 = 5 + 1 = 6. 7.1 sound is an improvement on 5.1, in that it further divides the surround speaker array into four sections: Left Side Surround (Lss), Right Side Surround (Rss), Left Rear Surround (Lrs), and Right Rear Surround (Rrs). This adds up to 8 channels of sound. The channel labels L, C, R, Ls, Rs, Lss, Rss, Lrs, Rrs, LFE, and more, are defined in SMPTE ST 428-12 DCDM Common Audio Channels and Soundfield Groups. 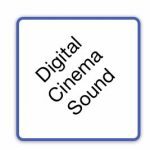 In digital cinema, the MainSound Track File defines the carriage of 16 channels of sound. Of course, 16 channels is never enough, and emerging immersive sound formats allow a much more complex array of signals. Since 5.1/7.1 sound only occupies 8 channels, at most, of the available 16, there remain 8 channels of bitstream carriage for other signals that are to be synchronized to the movie. It is in these available sound tracks where Assistive Listening and Narrative audio tracks reside, motion seat data resides, as well as compressed video for assistive sign language. While the concept of surround sound has been around since the 1940’s, the horseshoe-shaped surround speaker array commonly found in cinemas today was established in the 1970’s, with the introduction of the “Stereo Optical” format by Dolby Laboratories. The 5.1 and 7.1 sound formats, in common use today, simply divide the surround speaker array into multiple channels. The progression of surround sound formats is illustrated below. The concept of Soundfield Groups embodies the idea that a multiplicity of sound channels will continue to evolve. What has actually evolved, however, is a more generalized concept of cinema sound, where a common set of sound channels, forming a sound bed, is combined with more localized sounds rendered across speakers located above and about the audience. This is the basis of Immersive Sound formats. A key characteristic of Immersive Sound is the 3-dimensional positioning of sound objects through the application of metadata, a rendering engine, and an appropriate loudspeaker system. To further break from the channel concept, sound objects of limited duration can simply be carried as a chunk of audio. In this manner, a rich soundfield may be created without the need for a large number of sound channels in distribution. In practice, 5.1 / 7.1 speaker arrays are combined with additional speakers located above and about the audience, in combination receiving audio from the rendering engine. Commercially available cinema immersive sound formats are available from Dolby Laboratories (Dolby Atmos®), DTS (DTS:X®), and Barco/Auro Technologies (Auro-3D®). Each of these formats consist of a unique distribution format and proprietary rendering engine. As of this writing, a SMPTE standards committee is working towards a common distribution format for immersive sound. The common distribution format is intended to drive competitive and proprietary immersive sound rendering engines. The MainSound Track File audio characteristics of bit depth, sample rate, channel count, and reference level are defined in SMPTE ST428-2 DCDM Audio Characteristics, which are applicable to both Interop DCP and SMPTE DCP. The maximum number of audio channels carried in the Sound Track File is 16. Audio channels in the Composition map to the audio outputs of the media block or server in a one-to-one manner. An audio signal carried in channel 1 of the track file will output at channel 1 of the media block or server. Audio signals are typically paired in AES3-formatted streams for output. The pairing takes place in numerical order, i.e, audio channels 1 and 2 are output in the 1st AES3 signal, and so on. The one-to-one mapping of channel to output occurs for both Interop DCP and SMPTE DCP, although SMPTE DCP has exceptions discussed further below. It was noted earlier that the signal order described in the table above also describes the ordering of audio outputs from the media block or server. If Left audio is to be placed differently in the track file, then the playback device must route the Left signal to the output defined in the table for interoperability. SMPTE DCP prescribes several incompatible methods for packaging 5.1 and 7.1 audio. Of these multiple methods, it is recommended that only the channel configuration defined in SMPTE 429-2 DCP Operational Constraints, Annex A, Channel Configuration 4, be used in commercial distributions. In this channel configuration, the ordering of audio and data channels defined in Table S-1 above is recommended. However, SMPTE 429-2 also offers a few other methods for packaging 5.1 and 7.1 audio. SMPTE 429-2 defines alternative packaging channel configurations for 5.1 and 7.1, as well as configurations for other sound formats. In addition, it is possible to label each audio channel in accordance with the SMPTE ST 377-4 MXF Multichannel Audio Labeling Framework. These alternative methods for packaging multi-channel audio order the channels differently, and as discussed, require signal routing in the media block or server to output the signal to the proper speaker or device. However, the alternative methods in SMPTE DCP are not available in Interop DCP, and not all media blocks and servers are configured to properly route signals. For SMPTE DCP, it is recommended that Channel Configuration 4 and the signal ordering described in the table above be used for compatibility.